Criminal justice schools in North Dakota train students to fight against drug trafficking, solve crimes and protect the general public. Since North Dakota sits on the Canadian border, there is an ongoing demand for border patrol and law enforcement officers that protect the nation’s security. The United States Justice Department provides funding for many law enforcement, narcotics control and security initiatives every year. Those looking to be a part of the border patrol crew or work directly with civilians will find a variety of attractive career opportunities across the state. 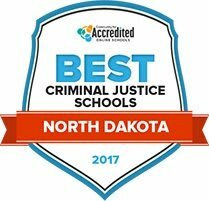 Learn about educational requirements and career information for criminal justice jobs in North Dakota. After Criminal Justice School in North Dakota: What's Next? Finding criminal justice schools in North Dakota that offer the right degree level and training for different legal and protective service jobs in the state can be a challenge for some. To help students find the best program that meets their individual needs, we have analyzed criminal justice schools and programs across the county to find 2017's best academic options. Use the ranking list below to narrow down the search process and compare different schools by enrollment numbers, tuition, acceptance rate and other key factors. Lake Region State College was accredited in 1973 to offer the first two years of a baccalaureate education in fields including technology, law enforcement, and health care. Associate degree programs are available in 18 majors, and there are 10 certificate and certificate of completions in a range of career disciplines. The 60-credit associate in applied sciences degree program in law enforcement can be completed in two years and is offered at the Devils Lake Campus and online, including the state peace officer training component. The one-semester certificate in peace officer training satisfies North Dakota training requirements. The criminal justice bachelor's program at the University of North Dakota draws on a multidisciplinary approach, taking resources from the criminal justice, sociology, philosophy and anthropology departments. The program prepares students for entry-level careers in the criminal justice system, for graduate school or law programs. There are also options for those already working in criminal justice to expand their knowledge. Students study topics like policing, corrections and juvenile delinquency. They also learn solid theoretical approaches to criminal justice. Students can also choose from a list of electives on topics like correctional alternatives and criminal investigation. At the North Dakota State University-Main Campus, students can study to obtain a bachelor's degree in criminal justice. Students learn about the courts, corrections, social services and law enforcement systems. After completing the program, students can go on to work in law enforcement, probation, correctional work, victim advocacy and halfway houses. Graduates have even gone on to work for the FBI, U.S. Secret Service and the Bureau of Criminal Investigation. Students take courses in behavioral science, humanities, social sciences, computer science and accounting to prepare for their careers. The program also focuses on fostering a well-rounded education in general education requirement subjects like composition, science and wellness. Students at Minot State University learn about the issues facing criminal justice systems both in the United States and the world at large. Students learn about concerns like prison overcrowding, domestic abuse and terrorism. The program prepares students to enter the workforce upon graduation, or to pursue graduate-level work after their undergraduate studies. Students can expect to graduate and get careers in the law, courts, corrections, juvenile justice or law enforcement. As part of the bachelor's program, there is also a Peace Officer Training Program (POST) every spring semester, which allows students to graduate with a bachelor's degree in criminal justice and a POST certification. The United Tribes Technical College offers a bachelor's degree in criminal justice. Students gain a wide range of skills related to criminal justice so they can enter the field upon graduation. Students can expect to be prepared to work as state, federal or tribal law enforcers, correction officers, victim advocates, in homeland security, in military investigative services or as probation officers. As part of the program goals, students will be able to maintain professional conduct, use criminology theory, use technological abilities, use communication skills and process ethical decision-making abilities. Students will study pertinent topics like criminal law, drugs & crime, media relations, policing and criminal investigations. The University of Mary's Bachelor's Degree in Criminal Justice will prepare students to enter a wide array of criminal justice professions, from law enforcement to the correctional system to the judicial system. The school prides itself on being grounded in Christian values that will help students work on a humanitarian level. The program boasts the years of experience in the field the professors who teach criminal justice courses have. That, along with internship opportunities, will give students real-world experience. Students go on to work in criminal justice across multiple systems like corrections, juvenile justice, homeland security and private security. The University of Jamestown offers a number of resources to students in the criminal justice department. Students have internship opportunities to pursue, for starters. The major also pairs well with complementary minors and other majors so students can have more direction in planning their career paths. The classes are small so students get one-on-one attention from professors. There are also field experiences and co-curricular activities that give students a hands-on approach to their learning, like the Criminal Justice Club. Students will be prepared to work at local, state and federal levels. Individuals interested in a career as a private investigator, border patrol officer, juvenile corrections officer or court clerk will need to find a school that supports their career goals. Many criminal justice degree programs prepare students for the intensive training they need to complete later at a dedicated trading facility somewhere in North Dakota. Use the tool below to compare schools based on different factors, including majors offered, tuition and degree programs. Criminal justice careers North Dakota are government-funded positions, and there is an ongoing need for highly trained individuals in this field. For instance, in 2015 North Dakota received a $447,000 grant to manage its 11 narcotic task forces alone, in addition to other financial backings. Some careers require completing an academy program while others require at least a bachelor’s degree or certification in the field. Use the tool below to compare some of the most popular criminal justice careers in North Dakota. Criminal justice jobs with attractive pay ranges can be found in larger cities and populated areas, including Fargo, Grand Forks, Watford City and Mandan. County governments, correctional facilities and sheriff’s offices in major cities are some good places to start the job search. Spending some time comparing salaries and available jobs in these areas with national averages can help to find the right fit. The table below illustrates the different career options available in North Dakota compared to national averages. Grand Forks, Bismarck, Fargo and Hillsboro are some of the larger cities with shopping malls, high-traffic public areas, and neighborhoods with high crime rates. Many available criminal justice position are government-funded and focus on law enforcement and security initiatives along the Canadian border. The table below highlights the largest areas of employment, as well as annual wages for jobs in legal and protective services in different areas. Lawyers at North Dakota Law Firms; Judicial Law Clerks at North Dakota Supreme Court; Administrative Law Judges, Adjudicators and Hearing Officers at North Dakota Supreme Court; Arbitrators, Mediators and Conciliators at North Dakota courts system; Judges, Magistrate Judges and Magistrates for the North Dakota Courts System; Paralegals and Legal Assistants for North Dakota Courts and Law Firms; Court Reporters for North Dakota Supreme Court and North Dakota Court Systems; Title Examiners, Abstractors and Searchers for North Dakota Real Estate Agents and Attorneys; Legal Support Workers for area law firms. This website serves as a resource for entrepreneurs and business owners from the State Government. Includes rules and regulations for nonprofits, business registration details and online services. This website provides Information about federal environmental regulations and rules from the North Dakota Department of Health (DOH). Includes information about hazardous waste, inspections and recycling laws. This site provides resources for business owners and information about trademarks, copyright laws and patents. Also includes details about business structures, franchises and professional employer organizations. The U.S. SBA promotes small business growth by providing information and financing resources to entrepreneurs. The GNDC has educational resources on issues and legislation that affects business owners in the state of North Dakota as well as a membership program and resources for business success. This group provides resources and legislative information for people who are interested in the economic development of business communities in North Dakota. Those interested in a career in corrections can reference this page for details about different types of career opportunities. Job openings in different business units are listed on the North Dakota State Government job board. Those looking for a rewarding career in the field of corrections can follow the instructions on this site. HACTC provides correctional officer basic training in Bismarck, ND, within the first year of hire and all tools and equipment. Individuals interested in working exclusively with youth can explore career options at the North Dakota Youth Correctional Center in Mandan, ND. This page includes contact information about the correctional facility designed for troubled adolescents. This division’s role is to improve public safety for people who are on supervision after legal infractions. The CSG provides information about research-driven strategies to improve criminal justice and public safety across the country. Part of their purview is to provide recommendations for correctional reform. This website provides full access to North Dakota District Court Case information for all types of cases. Search results include municipal court cases from different areas. The United States District Court in North Dakota is located in Bismarck with a divisional office in Fargo. This page features the latest employment listings in North Dakota, as well as national listings for those looking for career opportunities. Those interested in working in corrections, human services, or the legal field can explore job opportunities updated regularly on this job board. The job board makes it easy to save jobs and apply online. The NDCRA provides networking opportunities and resources for court reporters in the state of North Dakota. This government page provides information about alternative dispute resolution in North Dakota. The ACLU of North Dakota provides information and resources about its efforts to ensure that criminal justice issues comply with human rights principles. This non-profit organization provides free legal assistance to low income individuals and the elderly in North Dakota. The site lists pro bono opportunities and law internships for those who want to gain valuable skills working in the legal field. This website provides updates about the latest events and activities of the American Civil Liberties Union. It works to ensure all prisons, jails and juvenile facilities comply with the Constitution, federal law, and international human rights principles. The Careers section of the site features the latest job listings with the organization. This site includes a comprehensive list of legal resources for law students and lawyers, including the North Dakota Constitution, North Dakota Statutes and bankruptcy court information. A resource for lawyers and the public, the SBAND provides continuing legal education, information about the bar and updates about community-related events. WDALA is a membership-based organization that provides networking and educational opportunities to paralegals and legal assistants in western North Dakota. The RRVPA is a membership-based group that helps with the professional development of paralegals in North Dakota. This non-profit offers legal assistance and representation to low-income and elderly people in North Dakota. Those looking for a job in a community oriented law enforcement agency in Fargo can find information about employment opportunities, testing locations and handbooks for police officers on this website. This website includes information about qualifications and eligibly requirements for those working in private investigation and securities fields. The site also includes information for license holders, meeting minutes, and news. A non-profit organization comprised of members from the Sheriff’s Office throughout the state, the NDSDA seeks to advance law enforcement practices in North Dakota. This page provides information on how to enroll in LETA as well as additional contact information. This page provides the latest information about the agency presence of the U.S. Fish & Wildlife Service across the state. It outlines the different programs, locations and funding dollars for grant programs. This organization serves is an advocacy organization for its members and is involved with membership events and other activities. The site includes membership information and details about organizations that support its mission. This website is maintained by the North Dakota State Government and includes licensing information, maps, and the latest news relevant to the wildlife and conservation industry. This page provides information about the duties of law enforcement when it comes to wildlife conservation. This webpage provides information about the agreements between tribal police and state agencies.